Description: We offer a stand alone E (Mod. 510E) trumpet as well as a combination Eb / D trumpet (with a D bell and valve slides set) with bell size 1 (mod. 51). 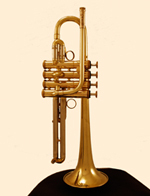 Four-valve versions of the Eb/D trumpets are also available (Mod. 5104).